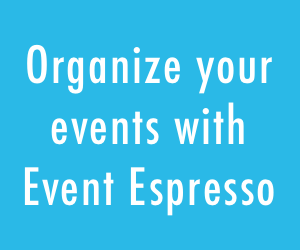 In our journey to empower business and organization leaders with the event registration, ticketing, and management tools that maximize the success of their events, we’ve learned that customer feedback and open communication are an important asset to the success of the Event Espresso plugin for WordPress. However, up until recently, we haven’t had a very efficient way of tracking each request, allowing the community a place to vote on features, or tracking progress of the Event Espresso project. We felt we needed a public roadmap to help keep the community in the loop and to keep feature requests from getting lost. Trello is an easy to use, real time, visual project management tool based on the Kanban system, which was developed in Toyota as a system to keep production levels high and maintain flexibility. It is best represented as a whiteboard filled with post-it notes. 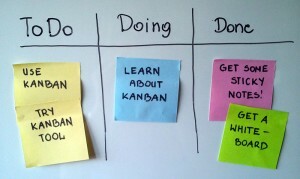 Each post-it represents different tasks involved in the project. We felt a public Trello Board was a great place for us to engage with the community, get feedback, share our development, and keep you up-to-date on upcoming features & releases. So last year we quietly launched our Event Espresso Public Roadmap on Trello to give our community a place to follow feature planning and development. Since making the board public, we’ve already had quite a few votes and comments come through over the past few months, by way of mentioning the public roadmap in the support forums. We hope this gives the Event Espresso community a bird’s eye view of features that are in the backlog and which are being completed in preparation for a major release. Going forward we plan to follow the roadmap as best we can and will continue to post requested features to the public roadmap for the community to vote on. 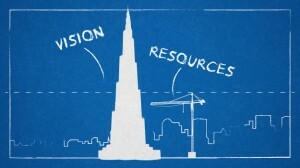 However, sponsored development is a service we offer to the community. If a community member sponsors a feature, then we agree to prioritize that feature ahead of some other things. A perfect example of this is when Event Espresso users want a new payment gateway, they can fund the initial development and we put that feature higher on the priority list and try to work on it asap. 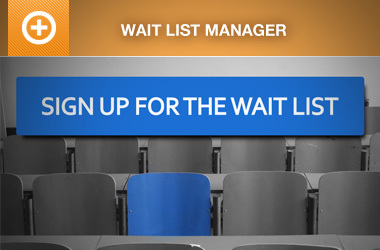 Some very popular items, like recurring events, require development of underlying systems and features. 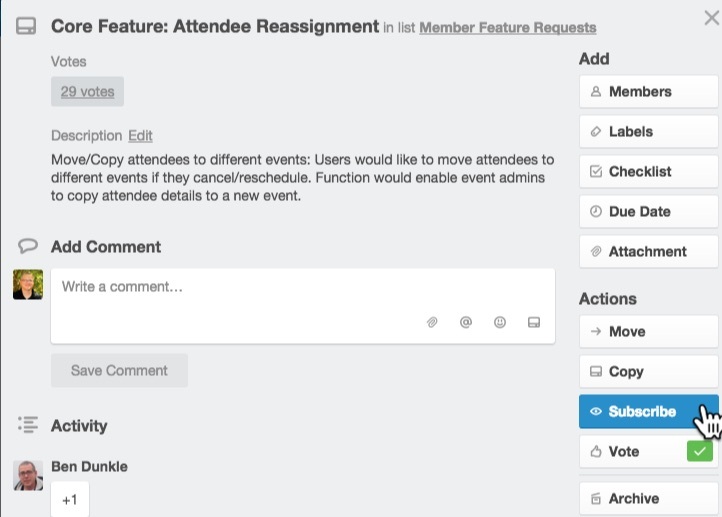 For example, core features such as Attendee Reassignment or wait lists, will need to be in place before we start work on the Recurring Events add-on (you wouldn’t want to have dozens of recurring events without an easy way to move attendees from one event to another would you?). 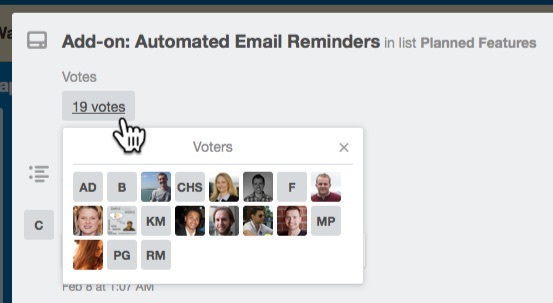 Another example would be the Automated Email Reminders add-on, which will require the Messages Activity core feature (notice that’s a feature in and of itself). If you have a new feature you want to see listed in the public roadmap, please create a new thread in our support forums and describe the feature as best you can. That way our support team can discuss the feature with you, and if appropriate, get it added to the roadmap. Once your feature request is added to the roadmap, yourself and other community members will be able to vote and leave comments on the feature. Our support team will also forward any new requests for the feature to the roadmap. We feel voting on features is especially useful to us, because it means we can list a bunch of features that we want to get done on the board, and then let the public vote up the features that they want the most. This allows us to take the community’s input for what they deem most important into our process for setting priorities. Please feel free to vote on as many feature as you like. 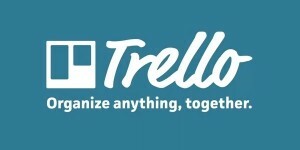 Trello uses a system of boards, lists and cards. This creates a system that allows for individuals or teams to track a project and collaborate or contribute where they can be most useful or where it is most needed. A board is typically a project or product that is under development or consistently being worked on. A list is a way to divide a board into different categories. Typically a list represents a stage of progress (to do, in progress, finished). A card is the most basic and flexible part of the system. It represents a specific element of a project (A new feature, a software bug, research for a post). We can move cards between lists as they progress through the project. There are three ways to subscribe for updates in Trello. You can subscribe to the entire Trello Board, individual lists, and/or individual cards. 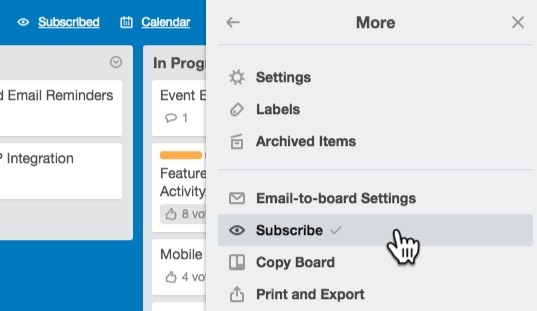 Subscribing to the Trello Board – Click the “Show Menu” button in the top right corner (screenshot) of the Trello Board, then click the “…More” link, then click “Subscribe” (screenshot). Subscribe to a List – In the top right corner of each list is a tiny down arrow. Click the arrow, then click the “Subscribe” link (screenshot). 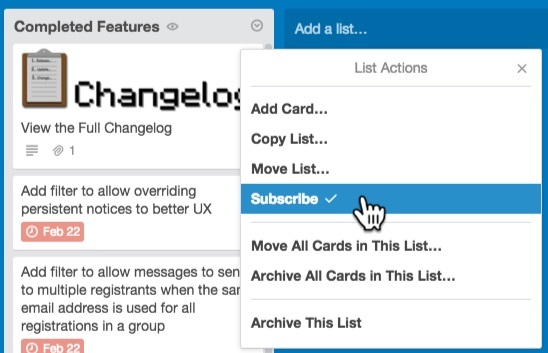 Subscribe to a Card – Click to open an individual Trello card, then click the “Subscribe” button under the “Actions” heading (screenshot). We’ve been focused on making core improvements over the last several months and are currently wrapping up development on EE 4.9, which includes a major refactor of the Event Espresso Messages System. The messages system refactor introduces a few new features, such as a messages queue, batch message processing, a recording system for sent messages, and the ability to resend failed messages. After that we will start work on the Attendee Reassignment feature and the Automated Email Reminders add-on. We realize many of you use Event Espresso as the backbone of your business and we hope this roadmap will help give you an idea of where the project is going. Please let us know in the comment section below if you have any questions. Trello looks awesome! It will be very helpful to see how things are progressing and why. 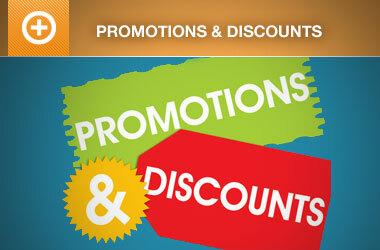 Additionally, being able to participate will be rewarding as well. Thanks again for a great product and community. You guys do awesome work and we appreciate you listening to our needs. This is terrific, guys – thanks! It’ll help us feel more in-touch with the priorities of EE and allow us to better participate in direction.